Christopher Bell drove his No. 20 Joe Gibbs Racing Toyota to Victory Lane for the third consecutive time Saturday when he won the NASCAR Xfinity Series race at Iowa Speedway. Bell somehow kept his car intact after Chase Briscoe spun in front of him with 14 to go. The 23-year-old Joe Gibbs racing rookie’s car sustained some damage, but he managed to maintain the lead after the restart — until Garrett Smithley spun out to draw another caution flag. On the following restart, Justin Allgaier — who won the June race at Iowa — drove the high groove to the lead. Bell was shuffled back to fourth during a four-wide restart that lasted one lap before contact between Matt Tifft and Max Tullman caused the red flag to wave. Bell regained the lead the final restart. Allgaier said he felt Bell didn’t race him as clean at the end. Bell said his last-gasp restart maneuver past Allgaier had been executed according to plan. “I mean, I haven’t seen it so I don’t know, but the spotter was yelling clear and if I’m clear then it was clean,” Bell said. (3) Christopher Bell #, Toyota, 257. (7) Justin Allgaier, Chevrolet, 257. (4) Kyle Benjamin, Toyota, 257. (18) Ross Chastain, Chevrolet, 257. (11) John Hunter Nemechek, Chevrolet, 257. (1) Elliott Sadler, Chevrolet, 257. (19) Ryan Reed, Ford, 257. (14) Ryan Truex, Chevrolet, 257. 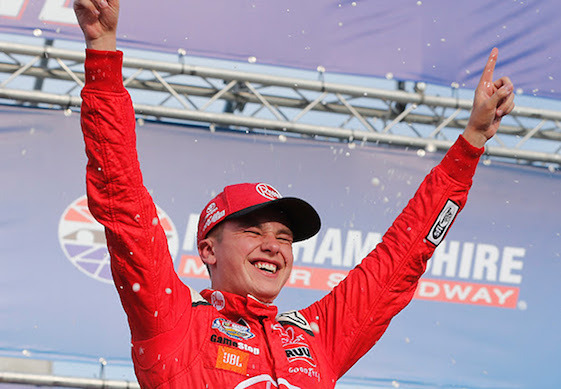 (2) Cole Custer, Ford, 257. (12) Chase Briscoe, Ford, 257. (10) Daniel Hemric, Chevrolet, 257. (9) Brandon Jones, Toyota, 257. (8) Shane Lee, Chevrolet, 256. (17) Michael Annett, Chevrolet, 256. (15) Casey Roderick, Chevrolet, 256. (21) Alex Labbe #, Chevrolet, 255. (22) Joey Gase, Chevrolet, 255. (6) Austin Cindric #, Ford, 254. (23) David Starr, Chevrolet, 253. (13) Jeremy Clements, Chevrolet, 253. (25) Tommy Joe Martins, Chevrolet, 253. (5) Tyler Reddick #, Chevrolet, 252. (27) Spencer Boyd #, Chevrolet, 252. (31) Josh Williams, Chevrolet, 251. (24) Garrett Smithley, Chevrolet, 250. (16) Matt Tifft, Chevrolet, Accident, 249. (28) Brandon Hightower, Chevrolet, 249. (30) Ray Black II, Chevrolet, 248. (34) Vinnie Miller #, Chevrolet, 247. (26) Max Tullman(i), Ford, Accident, 245. (36) Peter Shepherd III, Toyota, 242. (35) Mike Harmon, Chevrolet, 241. (37) Stan Mullis, Chevrolet, 236. (20) Ryan Sieg, Chevrolet, 206. (32) Jeff Green, Chevrolet, Ignition, 140. (40) Dexter Bean, Chevrolet, Vibration, 73. (29) Chad Finchum #, Toyota, Brakes, 56. (33) Morgan Shepherd, Chevrolet, Brakes, 46. (39) Stephen Leicht, Chevrolet, Electrical, 36. (38) Josh Bilicki #, Toyota, Engine, 2. Average Speed of Race Winner: 97.772 mph. Time of Race: 2 Hrs, 18 Mins, 00 Secs. Margin of Victory: 0.421 Seconds. Caution Flags: 6 for 41 laps. Lap Leaders: E. Sadler 1-26; C. Custer 27-67; E. Sadler 68-82; C. Custer 83-115; C. Bell # 116-123; C. Custer 124-153; C. Bell # 154-200; B. Jones 201; K. Benjamin 202-206; S. Lee 207-212; C. Bell # 213-249; J. Allgaier 250-255; C. Bell # 256-257. Leaders Summary (Driver, Times Lead, Laps Led): C. Custer 3 times for 104 laps; C. Bell # 4 times for 94 laps; E. Sadler 2 times for 41 laps; S. Lee 1 time for 6 laps; J. Allgaier 1 time for 6 laps; K. Benjamin 1 time for 5 laps; B. Jones 1 time for 1 lap.